Headaches can affect everyone's day, and many times no one knows why they are occurring. In fact, about 20 million doctor visits in the U.S. a year are for headaches, according to the University of Georgia. Many headaches are treated with over-the-counter drugs, but there has been research on other treatments, such as DHEA. As with any supplement, seek advice from your doctor before using DHEA. The hormone dehyroepiandrosterone is known by the acronym DHEA. This hormone is naturally occurring and produced in the human body. DHEA is released from the adrenal gland to serve as a precursor for many hormones, including testosterone, progesterone, estrogen and cortisol. If DHEA is imbalanced it could affect the levels of the hormones it creates. Many woman suffer through menstrual cycle migraine headaches due to estrogen and progesterone being off tilt. According to MayoClinic.com, large amounts of DHEA in the system may sometimes induce headaches. Consult a doctor if you are supplementing with DHEA and are noticing more frequent headaches. According to the University of Maryland Medical Center, DHEA has been shown to help people with chronic fatigue syndrome by increasing energy and overall well being, as well as reducing the headaches that are one of chronic fatigue syndrome's symptoms. Using DHEA may be beneficial for those seeking relief from migraine and hormonal headaches. Since DHEA is a precursor to progesterone and estrogen, it could help women during their menstrual cycle. Progesterone and estrogen, at lowered concentrations, can be responsible for migraines and their corresponding symptoms of nausea, vomiting and increased photosensitivity. The National Headache Foundation states that a menstrual migraine can last until progesterone levels fall back into a homeostatic concentration, or are "normal" again. Women who are pregnant and are suffering from hormonal imbalances should not take DHEA according to MayoClinic.com. This is because DHEA is a hormone and may be unsafe to the fetus or while nursing your child. You should be cautious when taking DHEA if you are suffering from tension or dull headaches. Changing hormone levels if you are healthy can cause dramatic changes that can affect emotions, personality and your endocrine system. These hormonal changes may even induce more headaches or increase their severity. As you get older, you produce less DHEA. This in turn causes less progesterone, testosterone, estrogen and cortisol to be created. Supplementing with DHEA can then balance out your hormones and decrease the onset of headaches caused by hormones. If you choose to supplement, MayoClinic.com advises you keep it in a range of 25 to 200 mg a day. DHEA is a precursor for cortisol, the "stress" hormone. 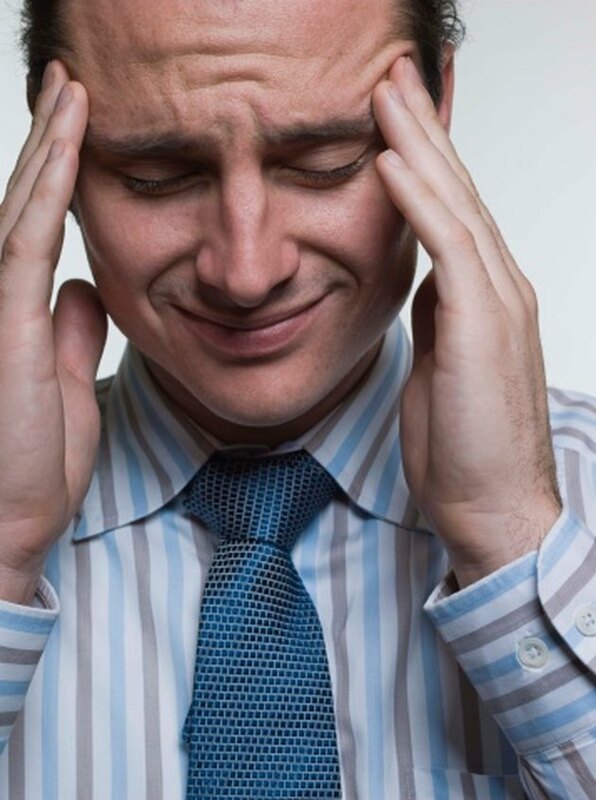 According to the National Headache Foundation, stress is key factor in inducing tension and migraine headaches. DHEA has been shown to combat the effects of cortisol, despite it being a precursor for it. According to Vanderbilt University, DHEA will inhibit the stress effects of cortisol If there is a higher ratio of DHEA compared to cortisol in your system. These effects show that DHEA attempts to eliminate the stress response depending on the amount of DHEA in your system.